Marchesa, the Black Rose ($1.23) Price History from major stores - Conspiracy - MTGPrice.com Values for Ebay, Amazon and hobby stores! 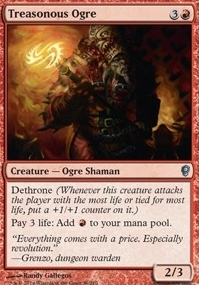 Card Text: Dethrone (Whenever this creature attacks the player with the most life or tied for most life, put a +1/+1 counter on it.) 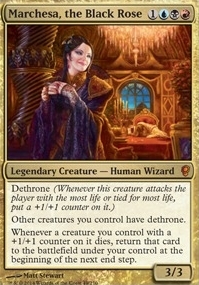 Other creatures you control have dethrone. 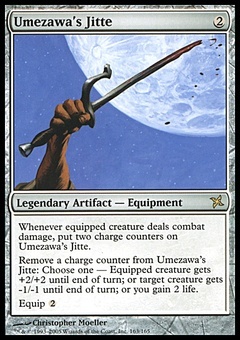 Whenever a creature you control with a +1/+1 counter on it dies, return that card to the battlefield under your control at the beginning of the next end step.